Thank goodness the rehab doctor came into his room the following day to give Paul hope he would have a chance to gain some movement back, but until that day occurred, his attention and efforts needed to be focused on rehab to strengthen his upper body. Paul felt that desire to get back on the road, to go where he wanted to go, when he wanted to go. This was when he realized helping others made his life more rewarding. If it was that important for Paul to get back on the road, he knew he could show others how to get back on the road of life. He DID get on the road in 1982 with his first wheelchair race. He moved to Kentucky in 1994 and 12 years later, he was training for a marathon! Then a second accident would change Paul’s life even further. In July 2006, while speeding down a steep hill during a training run, Paul encountered a pickup truck on the other side of the road. While trying to move over, he lost control of his wheelchair and slammed into the driver’s door of the truck. He sustained multiple open fractures, two broken ribs, a punctured lung, a spinal compression fracture and the avulsion of part of his scalp. It was 94 degrees that day. “It’s an accident, ‘Don’t touch him, don’t move him,” medical technicians said. Unfortunately Paul was lying on the hot asphalt, which resulted in burns on 60 percent of his back. The accident led to one helicopter ride, two hospital stays, three rehab stints, four operations and five months out of work. 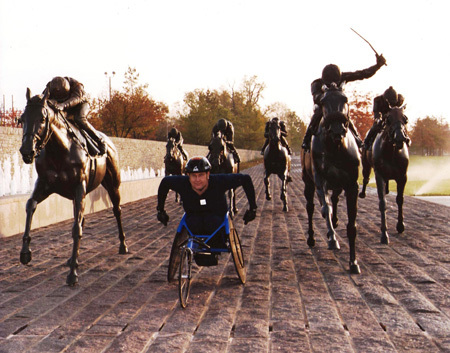 In 2010 Paul set out to tackle the world’s premiere wheelchair marathon in Oita, Japan. Having reached such an incredible goal, he was left wondering where he would find his next motivation. Paul joined another wheelchair athlete with a goal of 50 Marathons in 50 States in 50 Weeks! Paul races for many reasons but to “set an example for others” with disabilities, to help them see through the fog of their challenges, so they can focus on the clarity of living life to its fullest is the ultimate purpose of his races.